i know the snow lays 'deep and crisp and even' all around but i have yet to actually see it with my own eyes. most of the country has disappeared under some seriously big dumps of snow and let me just fill in a few of you dear readers who are 'stateside'...we are talking the biggest amount of snow our little island has witnessed in over 20 years, and i do believe there is more to come...so that considered, my travels to family and charity shops maybe somewhat curtailed. glad you got here safe and sound...i have been looking up ominously at the grey skies....thinking about you! we have had approximately..the 3 kids have been counting...10 snowflakes. none of them stuck. i had to resort to defrosting the freezer so that they could at least throw ice at eachother! but clear roads here have meant that the technicians have been and i have an internet connection again! Hoorah! I am so pleased you have arrived at the enchanted cottage. 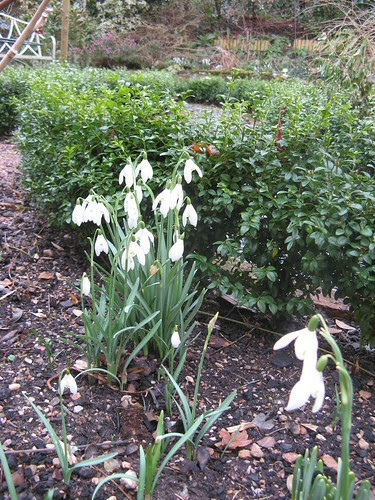 Those snow drops have come out for you. 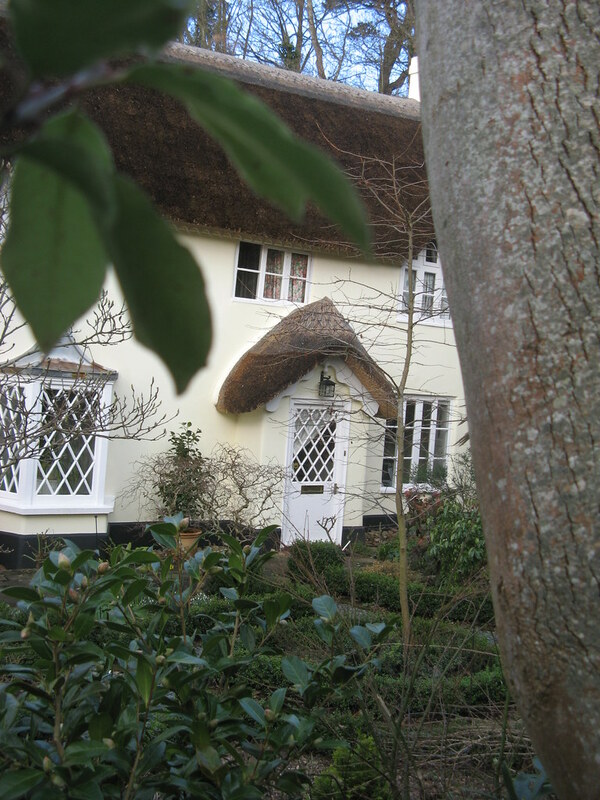 I love the thatch! How very not retro! Can't believe you have done that much charity shopping already, I think January is a good time, must get onto it. We have escaped a good bit of the snow over here in Norn Iron, only about an inch at the mo, but apparently it is on its way! I do think by the way that I have inherited a charity shop gene from my Mum (Jean). It certainly is very useful to say to people...I have a bit of a charity shop thing, got it from my mother, as if there is nothing you can do about it. Although it doesn't make me itch! Umm..'yard' now surely you mean garden! just checking innn. its terribly lonely here, just me and marlon writing valentines for his party friday, and he keeps chatting about tennis balls with holes in them, mentos, and god-knows what else, haha. bet you miss it, right? Good to know you're safe & sound and hitting the 'good shops' too! We are looking forward to your discoveries & adventures! Ah - Tif - you return to our shores in time to join the great dire news wallow. We are all buried under 6 foot of the white stuff, enduring a 30's style depression la-la-la. Nip down to the newsagents and get a copy of The Observer - great diy fash supplement!